Eternal Father strong to save, Whose arm hath bound the restless wave Who bid’st the mighty ocean deep, It’s own appointed limits keep, O hear us when we cry to thee, For those in peril on the sea. The early months of the year 1947 were to prove to be very severe for many of the population of Ireland. A food shortage existed in the country, in common with many other parts of the globe, which had not yet returned to normality following the Second World War. Rationing of food and other vital resources such as fuel and clothing was in force and to make matters worse, the Winter of 1947 happened to be one of the worst in living memory. The Country had been in the grip of freezing conditions for the entire month of February with snowstorms, and accompanying snowdrifts, which blanketed the countryside and made all movement extremely difficult. Power failures were frequent and added to the general misery. It was against this background that the M.V.BOLIVAR was making her way across the Irish Sea on the morning of Tuesday, March 4th, bound for Dublin Port with a badly needed cargo of grain and other essential items. Like many another fine ship before her, although Dublin Bay was in sight, the BOLIVAR would never reach that port and would leave her bones in the sands of that treacherous graveyard of ships that spans the entrance to Dublin Bay waiting to ensnare the unwary, the Kish Bank. The BOLIVAR was an almost new, steel-hulled vessel of 5230 tons, owned by the Norwegian shipping company of Fred Olsen and Company, a firm that still exists today. She was a twin-screw vessel powered by diesel engines and at the time of the wreck she was completing the final leg of her maiden voyage. Her dimensions were, 137 meters by 17.5 meters beam with a draught of 7.5 meters laden. The ship was named after Simon Bolivar, the South American revolutionary leader who was known as The Liberator, 1783 – 1830. Born in Venezuela he fought against the Spaniards in Colombia, Venezuela, Ecuador and Peru, part of which became Bolivia, named in his honour. The ship had been laid down in the yard of Akers Mekaniske Verksted of Oslo in 1939 and was launched in 1940, ready for fitting out. Following the German invasion of Norway in April of 1940 the ship lay alongside the quay wall at Akers yard for the duration of the war. It was commonly believed that the uncompleted vessel had been sunk at the bottom of a fjord to prevent her from falling into German hands but this does not seem to be the case. She was, however, holed by an explosion that partially flooded the hull during this period and this may have given rise to the story. When the war ended, the fitting out of the BOLIVAR was completed and she set out on her first voyage in the trade for which she had been designed and built, a round trip from Europe to South America and back carrying general cargo with provision for conversion to grain – carrying in her three holds by the addition of portable feeders and shifting boards. There were facilities on board for twelve passengers and on her maiden voyage she was carrying her full complement in addition to thirty-nine crew-members. When the BOLIVAR grounded at about 12.30 p.m. the two main engines were immediately put full astern. The main axis of the major part of the wreck today lies just slightly at a tangent to the north-south run of the bank so the transverse thrust of the propellers and the tidal run seems to have had the effect of slewing the ship around as she pivoted on the top of the bank. Some time seems to have been spent in trying to manoeuvre the vessel off the bank to no avail. The wind direction and the falling tide both contrived to keep the ship stuck fast. As the tide dropped further the ship broke in two from immediately in front of the center-castle, and the fore part of the vessel swung clear and grounded about a hundred yards away from the stern section. By coincidence, the BOLIVAR grounded about one hundred meters from the place where the cargo ship VESPER was wrecked in January 1876. Radio calls were sent out requesting assistance and were received by several stations around the Irish Sea at about 1.30 p.m.. The message read, “Aground on northern end of Kish Bank, require assistance of tugs.” At about 3.30, another call was received from the BOLIVAR stating that the ship was breaking up. This call included an S.O.S. Dun Laoghaire lifeboat station became aware of the situation at about this time and signals were fired summoning the lifeboat crew. The lifeboat, DUNLEARY 2 was on her way towards the wreck under the command of coxswain Sam Blackmore with a crew of eight volunteers at 4.30.p.m.. She came alongside the BOLIVAR at about 6p.m.. The Dublin Port And Docks Board tug COLIEMORE was already in the vicinity of the stricken vessel and had taken six members of the crew aboard from one of the ships lifeboats. They had attempted unsuccessfully to run a line from the ship to the tug. The Captain of the COLIEMORE, George Elliot, once told the Author that the conditions were the worst in which he had ever handled the tug. Coxswain Blackmore brought the lifeboat alongside the lee side of the stern section of the BOLIVAR and displayed great skill in manoeuvering the boat, which was surging up and down the side of the vessel, as the remaining passengers and crew boarded the lifeboat from the ships lifeboat ladder. This whole operation took almost two hours of split-second timing and precision boat handling as the lifeboat drove in alongside and the lifeboat crew snatched each person in turn from the ladder. The lifeboat would then pull away and come back alongside to repeat the process for each person rescued. The three female passengers and the three stewardesses were among the first to be rescued. It stands as a great tribute to the skill and bravery of the coxswain and crew of the lifeboat that the entire rescue was carried out in these arduous conditions without loss or injury except to one of the BOLIVAR`s crew, Mr. Anvard, who sustained a broken arm. Some damage was sustained to the lifeboat including the loss of a rubber belting and a damaged ventilator. The rescue is all the more praiseworthy as the one of the propellers had been damaged by floating wreckage and the other was fouled by a bale of rubber. The lifeboat headed back to Dun Laoghaire powered by one damaged propeller. She was accompanied on the return journey by the Howth lifeboat that had arrived on the scene just as the rescues had been completed. Many of the rescued passengers and crew were violently ill with seasickness in the cramped cabin of the lifeboat but were nevertheless grateful for having been rescued. All of the rescued crew and passengers were initially brought to the Royal Marine Hotel in Dun Laoghaire where they were given hot drinks. The injured crewman was brought to nearby St. Michael’s hospital. The crew were subsequently brought to Dublin where they were lodged in the various seamen’s missions before being repatriated to Norway. One of the rescued passengers of the BOLIVAR was an interesting character who had led a varied and adventurous life. This was Admiral Edward Evans, Lord Mountevans or “Evans of the BROKE”, 1881 – 1957. During the First World War while in command of the destroyer BROKE he had achieved a notable victory in an encounter with German warships in the Straits Of Dover. He had served as second in command to Robert Scott during his Antarctic expeditions and he had been awarded a gold medal by Lloyds for conspicuous acts of personal bravery during the rescue of Chinese passengers from the wreck of the steamer HOMG MOH. This was in 1921 while he was in command of the H.M.S. CARLISLE. He later commanded the Australian Navy. During an interview with the press, Lord Mountevans heaped praise upon all who had been associated with the rescue. In the immediate aftermath of the wreck it was hoped that at least the stern section could be salvaged. It quickly became apparent however that both the ship and the cargo would become a total loss. The ship settled further into the sand with every tide and the cargo of grain soon became waterlogged as the hatches were torn off by the rough seas. The beaches and shoreline around Dublin Bay from Bray to Howth soon became littered with debris and flotsam from the wreck and this was eagerly picked over by swarms of people despite the efforts of the police. Among the cargo were many bales of leather, some of which were washed in at the Shellybanks near Ringsend. There are many stories extant about handbags and coats being made from these. The Author was once shown some chairs in a house in Ringsend that were covered with some of this leather. Despite the presence of some of the ship’s officers who had gone back aboard, the passenger’s and crew’s accommodation, which were located in the after section of the wreck, were plundered by people who had come out to the wreck in fishing boats. Some of this booty was subsequently recovered by the police and customs, mostly in Dun Laoghaire Harbour. Coxswain Sam Blackmore of the Dun Laoghaire Lifeboat was in later years chosen to represent the R. N. L. I. during a programme that was broadcast on Norwegian Radio during the celebration of the jubilee of the Norwegian Lifeboat Service. A wreck buoy was placed in the vicinity of the BOLIVAR by the Irish Lights tender and much of the wreck which remained above the water was cut away and salvaged by the Hammond Lane Scrap Company. The bow section remained largely intact and sank beneath the surface while the after section was cut down to about the main deck line. The remaining portion was dispersed further by Jim Kearney, a well-known boat builder and hard-hat diver who placed a string of explosive charges around the wreck in order to bring it below the spring tide low water level. This was done on the instructions of the Commissioners of Irish Lights and in September 1948 a Notice To Mariners was issued to the effect that the dispersal had taken place and that the wreck buoy would now be withdrawn. The position of the wreck of the BOLIVAR, as marked on subsequent Admiralty charts, represents the bow section and this was reputedly dived by sport divers in later decades from a hired trawler. The transit marks given by fishermen over the years were as follows. The South Burford Buoy in line with the Poolbeg Lighthouse and the North Kish Buoy in the middle of Lambay Island. These were fairly accurate but difficult to use except in times of very good visibility. In 1986 the wreck was re-discovered by Mr. Roy Stokes in his half-decker VENTURE 1 that was equipped with Decca navigator and Echo sounder. This type of equipment had become cheaper and more available due to the electronic revolution and Roy was at the forefront of a new diving era in Dublin Bay. At first the bow section was dived in accordance with the mark on the chart. While drifting over the wreck to do some fishing the great bulk of the stern section came up on the echo sounder, much to the surprise of all and a dive was promptly organised for the following weekend. The Author and a colleague, Denis Kelly, were the first divers down on this section and it was immediately apparent that it had not been dived since the wreck had been dispersed. This was evident from the fact that there were pieces of brass and copper littered about which would definitely not have been there had the wreck been dived before. 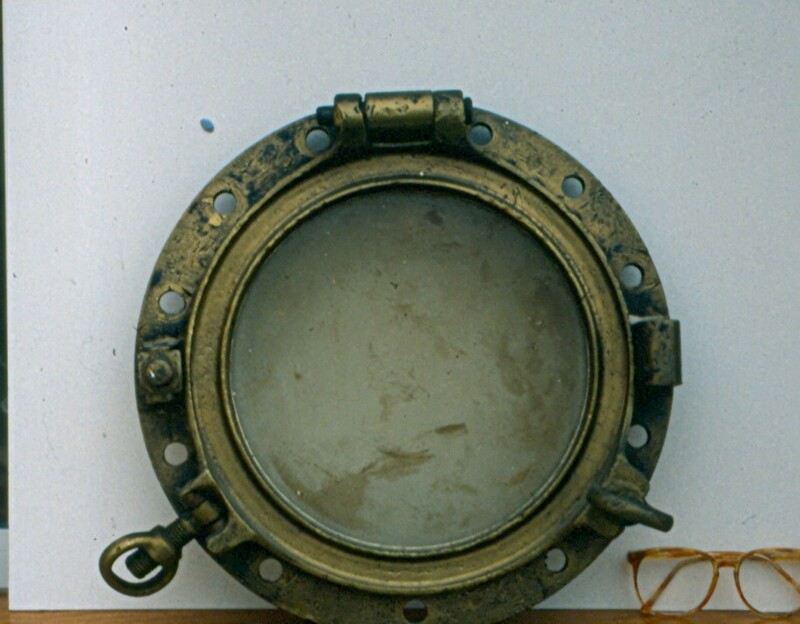 There were quite a few brass portholes in position right aft where the deckhands quarters and the steering flat were located and these were easily accessible being just off the seabed at between one and two meters on the starboard side while the port side ones were higher due to the fact that the vessel had settled with a list to starboard. A great deal of the lower parts of the wreck remained intact and listing to starboard. The entire rounded stern and bulwarks were visible with most of the timber decking of the poop deck still intact. The spare cast-iron propeller was still stowed in position here. Some derricks lay alongside this while just forward from here the twin diesel engines stood intact as did the ships boiler. Two of the goal-posts or Sampson posts of the derricks remained in place standing about six metres off the bottom and right where the break had occurred, a large white enamelled bath and several wash-hand basins protruded from the sand. Large gas cylinders that were littered about proved to be from the ship’s CO2 system for fighting fires. There is plenty of evidence of lost trawls on the wreck and some wreckage from the dispersal lies off to the sides. The underwater visibility on these first dives was, by the standard of the East Coast, spectacular. The marine growth presented a blaze of colour and the wreck swarmed with fish. Large pollack swam nonchalantly through the wreckage while a huge cod, it’s stomach distended from gorging on the available food supply, lurked beneath the engines. Large Ballan wrasse flitted to and fro and the antennae of lobsters protruded from under the plating. The blue – black heads of Conger eels could be seen as they skulked warily in holes awaiting their prey. These were frequently fed by the divers. Word quickly spread among the diving community and the wreck was soon picked clean of anything that moved or glittered. Larger dive boats with more powerful engines and R. I. B.s (Rigid hulled inflatable boats) were becoming available around this time and, as many more divers began to venture offshore, the BOLIVAR soon became one of the most popular dives around Dublin Bay. Much of the fish life remains and in subsequent years portions of the wreck became covered with sand only to become uncovered on the following season. In common with most of the wrecks that lie off Dublin Bay, it can only be dived at slack water for about one hour. As the direction of the tides turn about an hour and a half before the stated time, allowance must be made for this. The maximum depth of the seabed around this wreck is about eight to ten meters and on a calm day, with a low tide when anchored over the wreck, if you peer down you can see some of the growth encrusted wreckage just a few feet below the surface.